Despite extra challenges this year posed by the serious flooding in the region, the volunteers continued with the classes and were able to present the teachers with certificates of achievement at the end of the 6 weeks. 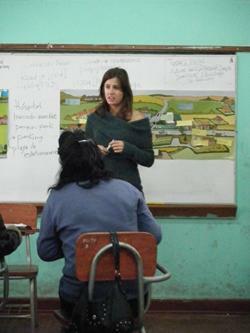 “Taking part in the Teacher Training program in Peru has been incredible. Volunteering abroad is meant to be an unforgettable experience but I dare to say that this particular project can be placed as one of the most gratifying, challenging and significant experiences to have in life. 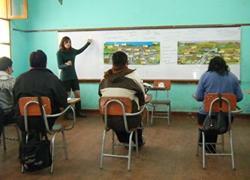 For six weeks we have been teaching both English and teaching strategies to Peruvian teachers. This particular project involves not only Projects Abroad but the Ministry of Education itself. Teachers are attending the course aiming to get a certificate that they need to get more hours to fill up their schedules, but they might as well just want to improve their English. The certificate they obtain at the end is therefore really important to them. Personally, as I aim to work in education, I want to stress how much I learnt from this experience. It really was a full-time job and it helped me to understand what teaching is (and is meant to be) at a depth I never experienced before.